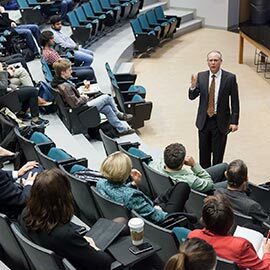 The Lazaridis School of Business and Economics hosted the latest in its Economist-in-Residence speaker series March 8. March’s talk featured Chris Ragan, chair of Canada’s Ecofiscal Commission, which launched in November 2014 with a five-year mandate to identify policy options to improve environmental and economic performance in Canada. Ragan is also an associate professor in the Department of Economics at McGill University and a research fellow at the C.D. Howe Institute. During his talk, titled “Nothing Rhymes With Ecofiscal,” Ragan discussed the economics of environmental policies, including carbon pricing and its implications for our provinces and for Canada as a whole. He also shared an overview of several reports from Canada’s Ecofiscal Commission that aim to answer the question of how to use free markets to prevent environmental degradation. The commission recommends pricing pollution and recycling the revenues that result. Ragan illustrated a type of pollution pricing using one of the commission’s reports, We Can’t Get There From Here. The report covers the various ways to implement traffic congestion pricing, which creates an incentive for drivers to choose transit alternatives and reduces congestion. Several cities, including London, Stockholm, Milan and Minnesota, have implemented this type of policy and seen significant results. The commission outlined several recommendations for Canadian municipalities to create similar pilot projects and reduce the traffic issues that are becoming a big problem across our major cities. After his talk, Ragan spent time mingling with attendees and answering additional questions.